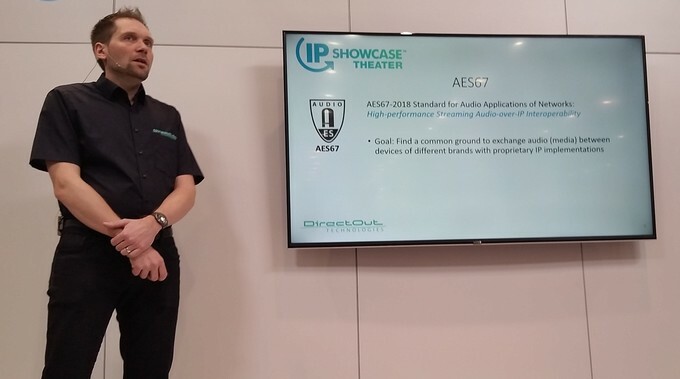 Claudio Becker-Foss presenting "AES67 and ST2110-30 Interoperability in Real Life"
The IP Showcase at the National Association of Broadcasters convention in Las Vegas opened today. As in previous years the AES is one of the sponsors. Anyone attending the NAB should stop by booth C12634 to catch the technical presentations. 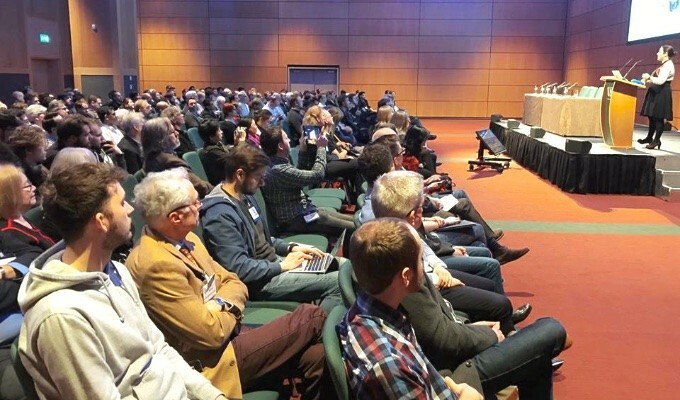 Tuesday will feature presentations about network audio technology including from AES members Claudio Becker-Foss, Andreas Hildebrand, Greg Shay and Leigh Whitcomb. All are experts involved in developing the AES67 standard. 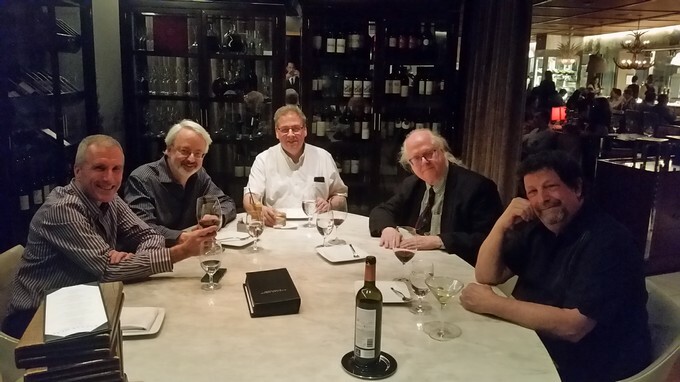 At the NAB show in Las Vegas representatives from AES Standards and SMPTE Standards met over dinner and discussed ways to improve their existing liaison relationship. The goai is to improve standards development in areas relevant to both societies. Networked audio and cinema sound systems were specifically discussed at length, though the opportunity for cooperation exists in other areas as well. Participating in the meeting were (from left to right) Bruce Devlin (SMPTE Standards Vice President), Richard Cabot (AES Standards Manager), Thomas Bause Mason (SMPTE Standrds Manager), Jeff Berryman (AES Standards Vice-Chair), Brian Vessa (SMPTE Cinema Sound Standards Working Group Chair). AES48-2019 AES standard on interconnections — Grounding and EMC practices — Shields of connectors in audio equipment containing active circuitry, has been published. AES48 specifies requirements for the termination, within audio equipment, of the shields of cables supporting interconnections with other equipment, taking into account measures commonly necessary for the preservation of EMC (electromagnetic compatibility) at both audio and radio frequencies. This standard specifies requirements for the connections of the designated shield contact of connectors built into audio equipment using active circuitry. These requirements are necessary for the preservation of electromagnetic compatibility (EMC) at both audio and radio frequencies. The Call for Comment on DRAFT AES73id-xxxx, "AES information document for acoustics – Loudspeaker driver comparison chambers" was published 2019-03-05. Acoustic performance measurements on loudspeaker drivers that are measured in different sites or with different equipment or methods are subject to variations in accuracy and repeatability. Similarly, end-ofline loudspeaker test systems often utilize small, arbitrarily shaped, driver measurement chambers that do not correlate from line to line, or from site to site. This document is motivated by the need for engineers in different locations to share accurate measurement data on specific or same type loudspeaker drivers and addresses some of the factors affecting repeatability of measurements in different locations. It considers factors affecting the interchangeability of measurement data from simple loudspeaker comparison chambers and discusses some performance capabilities. The Call for Comment on DRAFT REVISED AES31-2-xxxx, "AES standard on network and file transfer of audio - File format for transferring digital audio data between systems of different type and manufacture" was published 2019-02-23. The Broadcast Wave Format is a file format for audio data. It can be used for the seamless exchange of audio material between (i) different broadcast environments and (ii) equipment based on different computer platforms. As well as the audio data, a BWF file (BWFF) contains the minimum information - or metadata - that is considered necessary for all broadcast applications. The Broadcast Wave Format is based on the Microsoft WAVE audio file format. This specification adds a “Broadcast Audio Extension” chunk to the basic WAVE format. An optional Extended Broadcast Wave Format (BWF-E) file format is designed to be a compatible extension of the Broadcast Wave Format (BWF) for audio file sizes larger than a conventional Wave file. It extends the maximum size capabilities of the RIFF/WAVE format by increasing its address space to 64 bits where necessary. A set of machine-readable loudness metadata is included. This revision includes a new annex I to describe a universal 'ubxt' chunk to carry human-readable information in UTF-8 multi-byte characters to support international character sets. This is compatible with EBU v2 broadcast wave files. The Call for Comment on DRAFT AES72-xxxx, "AES standard on interconnections - Application of RJ45-type connectors and quad twisted pair cable for audio interconnections" was published 2019-02-15. This standard documents 8P8C (RJ45) pin-outs commonly used in analog and digital professional audio applications to carry four links, including channel/link order, signal polarity and phantom power compatibility. Type numbers are assigned to these variations, allowing manufacturers to easily specify which wiring standard is used in a particular piece of equipment. Users may use these type numbers to assess compatibility of disparate equipment in a given application. This standard also documents practical application details of interest to users of this technology. Conformance with this standard will identify mutually compatible devices, enabling users to avoid problems when employing equipment from multiple manufacturers. The Call for Comment on REVISION of AES48-2005, AES standard on interconnections - Grounding and EMC practices - Shields of connectors in audio equipment containing active circuitry has been published. AES70-2018 AES standard for audio applications of networks - Open Control Architecture, has been published in three parts. 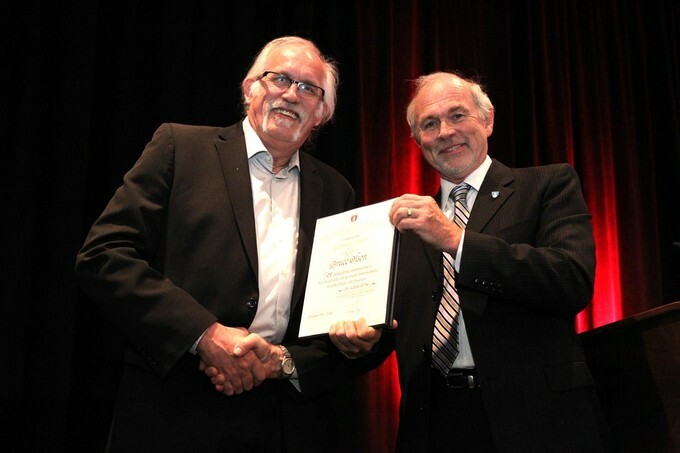 Bruce Olson, chair of the AES Standards Committee was awarded an AES Fellowship at last months NY AES Convention. Bruce has served as AES Standards Chair since 2011, previously having served as Vice Chair, Western Hemisphere for the Standards Committee and serving as Chair of the SC-05-05 Working Group on Grounding and EMC. 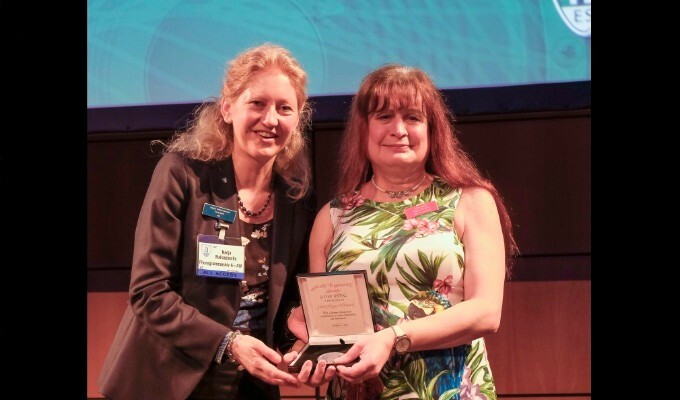 As part of his long service to the AES, he has also been a member of the AES Board of Governors and Chair of his local AES chapter. Bruce further known to many members of the AES through his consulting company Olson Sound Design and his long association with Ahnert Feistel Media Group.